Last week a news-broadcast on national Dutch TV reported that e-bikes are now even embraced by a most unlikely group: school children. Electric assisted bicycles have long had an image that they were for ‘old’ people, but apparently that is changing rapidly. “I don’t think the e-bike is for old people” is this girl’s sensible response to the rather leading question from the reporter of RTL-news. Road managers are also anticipating that people can cycle further in future because of the increased use of electric bicycles. That is the reason for so many long distance cycle paths that are being constructed all over The Netherlands. So let’s see the story of these school children who have discovered the e-bike to cycle to school. Most striking in this news-item for me was that cycle journey of 30 kilometres one way. Now that sounds like an awful long way – even for The Netherlands – and you could think the girl was exaggerating a bit, because 92% of all Dutch school children live within 15 km from their schools after all (see earlier post). So I did some investigation and I think the girl was not at all exaggerating! The father’s name was shown in the report and a quick search on the internet revealed that he lives in Zeewolde and works at a secondary school in Amersfoort. This is a school with a very specific type of religious identity of which there are only four in the entire country. If you work there it would make sense that you would want your children to attend such a school as well. There is no such school closer to Zeewolde than the one where he works in Amersfoort. If you then look at the distance from Zeewolde to that school in Amersfoort in the Fietsersbond cycle route planner it is exactly 30.7 kilometers! 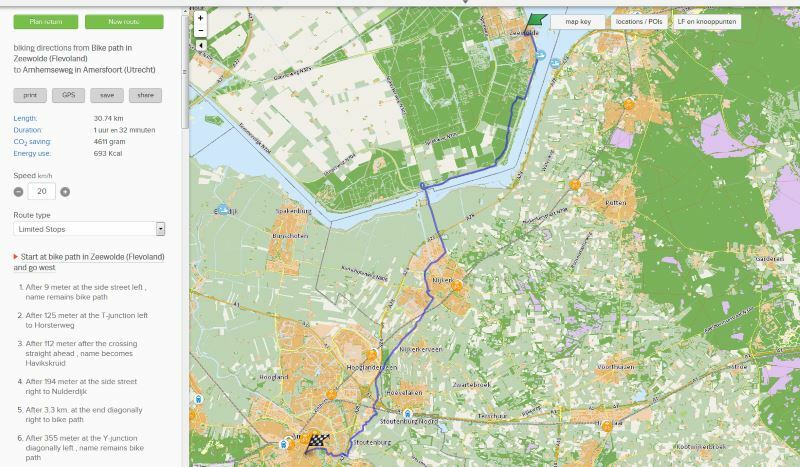 The route from Zeewolde to Amersfoort is indeed 30 kilometres! It is interesting to see that the girls must already have had an average speed of about 20km per hour to do the 30km ride in 90 minutes. E-bikes are limited to go no faster than 25km per hour in The Netherlands so they can only shave 15 minutes off their journey. They will still need 75 minutes one way. 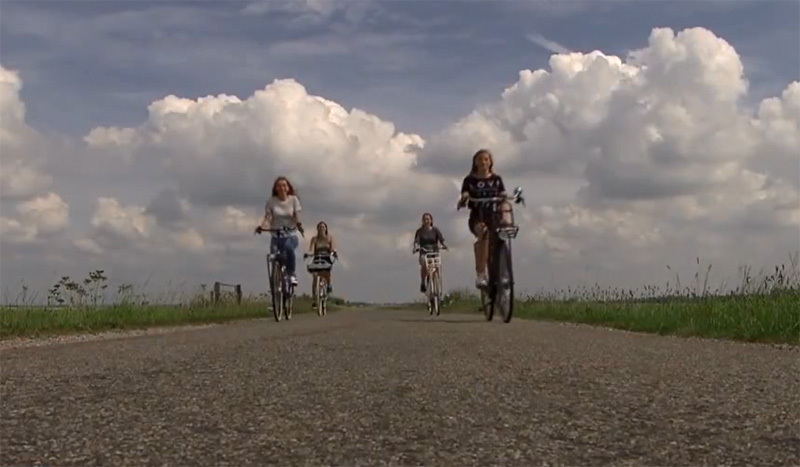 Even though cycling to school is very normal in The Netherlands, as I have shown you before, a total of 60 kilometres is quite an achievement for such young people to do that day in day out. Cycling in the Dutch polders, exposed to the ever present head winds is made a lot easier with an e-bike. The other thing standing out is the fact that 33 bicycles were bought at the same time! A package deal from a number of parents. Very nice for the seller as well! Selling e-bikes is very good for the bicycle shops. As I have shown you in an earlier post. Sales more than doubled to 223,000 electric bicycles in the last 7 years. The proportion of the turnover is even larger than the proportion of total sales. This particular deal came with a few extra services like an on road break down service and a full maintenance programme. The cost for the parents were €2000 per bicycle, including the service package. Since the school is four years this would come down to €500 per year. The father says public transport would cost him €4,400 or €1,100 per year. So it is a good deal, also considering the bike should last longer than those 4 years. Of course the girls told us they were cycling every day anyway so that would make this calculation not entirely correct. But even if they only used public transport for half of the time it would still be a good deal. For such long distances the e-bike is a perfect invention. No wonder so many people are discovering it. Hillary Staples over at the Holland Cycling Blog is not so happy with this development. See her reasons here. I don’t think it is such a problem that some of the e-bikers were formerly using ‘normal’ bicycles. I personally know quite a few examples of people who were formerly using a scooter or moped who are now using an e-bike. And I applaud every scooter that is taken off the road! So great to see more and more people being introduced to the benefits of the electric bike! Maybe you should ask David Hembrow or someone who speaks native English to review when you create subtitles in English, because some of the grammar is a little off. The words are right but not using syntax in the precise way. Even something like 45 years, maybe 42 years, whenever you started to learn, isn’t enough to make you perfect at it. I clicked on the school’s website, and interestingly, the front page had teenagers with their bicycles. What would you think Mark if ebikes were allowed to go up to 30 km/h and mopeds up to 50 km/h rural rather than the odd 25 and 45 km/h limits? It would also shave another 10-15 minutes off that girl’s commute of 30.7 km. Interesting article! While the Netherlands are a flat country, the motor in the front will do it for sure. Here in Switzerland, we need somewhat stronger so front wheel motors are getting very uncommon. Most e-bikes here have middle or back wheel motors. As we have lots of hills even hier in Zurich (Switzerland), where i commute to work almost all year round, i enjoy my fast e-bike, it would support up to 45 km/h, but of course i never make that in the city (lots of 30 km/h zones) – but it allows us to replace the car lots of time and we bike just for fun where we would never go with a normal bike. It is strong and we reach our destination not totally wet and exhausted. Of course there are still e-bikes supporting only up to 25 km/h, but if I want to get from A to B, it is fun even if you need to have a registration plate and the bicycle helmet is also required. As long as we do not have dutch bicycle roads, a helmet is always recommended… Please do not think “that are no bicycles”, the motor will only support if you pedal yourself. In the city, i am now faster than every car. Are these pedelecs or e-bikes with a throttle? These are the ones that have an assist. So you need to pedal or it won’t do anything and they are restricted to a maximum speed of 25km/h. It’s also worth noting that e-bikes, at worst, don’t really change the carbon footprint of a bicycle, and at best can improve it. However, that’s European-style pedelec operation, and per their own figures, the cyclist has their own contribution to the fuel consumption. American-centric figures tend to have higher emissions for a cyclist’s diet, and lower emissions for an American-style low-speed electric bicycle (partially because throttle operation is legal in the US, removing the human power share of the e-bike’s fuel consumption). Here is a North American analysis. The conclusions are the same though. The key to the ebike is not that it is more efficient than a regular bicycle, but that it permits more trips – both longer trips and enables those to ride who don’t otherwise have the ability. It is not the electricity that makes it bad, it is how the electricity is made. If the power comes from a wind turbine, then problem mostly solved, it is only the manufacturing of the Ebike that can do harm to the environment. Then again, a bus or car would need a lot more, even if electric, so that is still better for the environment. My wife is 72 and suffers from back and leg pain so 3 years ago I bought her a do-it-yourself e-bike conversion kit for her old hybrid bike for $699 U.S. It still works great. You get a replacement front wheel with a 250-watt 24-volt hub motor, a lithium-ion battery, a charger, a wiring kit and a handlebar switch.The whole thing weighs only 9 lbs. The battery can be detached in15 seconds and taken with you. Good security feature! This gizmo will go 20 miles on power at 15 mph. It is called Hill Topper. I got it from a U.S. website cleanrepublic.com There are various models at $499 to $1,049 U.S. My wife says this was her best ever birthday gift. She pedals her bike normally in country north of Toronto in Canada and uses epower only occasionally on hills or going against headwinds. For simplicity and practicality this system is excellent. 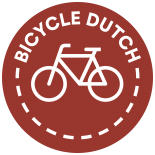 Thanks, Mark for another interesting story on cycling Dutch. Beste Mark, weer een interessant item! Ik wil even inhaken op dat 30km verhaal. Je geeft aan/denkt dat deze meisjes in Amersfoort op school zitten om religieuze redenen, vandaar die 30km enkele reis. Gezien de kleding die deze meisjes dragen heb ik alle redenen om daaraan te twijfelen. ‘t is vakantietijd hè! Maar ik had meer info gevonden dan ik hier openbaar maak, dus ik ben behoorlijk zeker van mijn zaak! Sander, dat klopt wel hoor. Het gaat hier niet om een ‘zwarte-kousen’ (gereformeerde gemeente) kerkgenootschap, maar om de ‘gereformeerd vrijgemaakten’, die eigen scholen hebben, maar qua kleding er heel gewoon uitzien. I tried my wife’s electric bike 3 years ago and was so impressed I bought one myself. After 2 years of continuous use, it has replaced the use of my car for local (20km) journeys almost completely for 8/9 months of the year. Not for ecological or economical reasons but because it’s 1. More fun. 2. Gives me some much needed exercise. And 3. often just as fast as the car. It also allows me to park directly outside my destination(s) rather than hunting for a space or car park. With a Burley Travoy (https://www.burley.com/product/travoy/) clipped on, it also carries 25kg of shopping or other cargo. I believe it’s called a ‘win win’ situation! In my short time on 2 wheels, comments from other cyclists on my e-bike invariably include the word ‘cheating’, although they seem to be at a loss as to what it’s cheating at. Negative comments normally come from those that haven’t experienced an e-bike. Every person that I’ve ever put on my e-bike and sent up the mountain road behind my home has come back with a very large s**t-eating grin on their face. After long considerations, I (age 47) finally bought myself an ebike last week. I use it for commuting every day since and I have ridden over 250km already. Average speed 23-25 km/h. Very comfortable. I’m not that tired anymore when I get home from work and it’s easier to make a small detour to make some deliveries. I’m very satisfied so far, alltough the battery capacity could be higher. Regardless, e-bikes ridden by old people in urban areas are a danger, a threat. Old folks just turn up the accelerator and other people thinking granny is just slowly cruising will be in for a life-threatening surprise. But here in Switzerland, where e-bikes are very popular, there are e-bike courses for “beginners”. My wife bought an ebike in Sydney yesterday. A Dutch Gazelle of course! In NL she already has a Dutch ID ebike she’s very pleased with, though she only uses it for longer country rides. It means she can ride faster than me, for a change, which is good for domestic harmony! This entry was posted on 20 August 2015 by Bicycle Dutch in Original posts and tagged bicycle culture, e-bike, school.